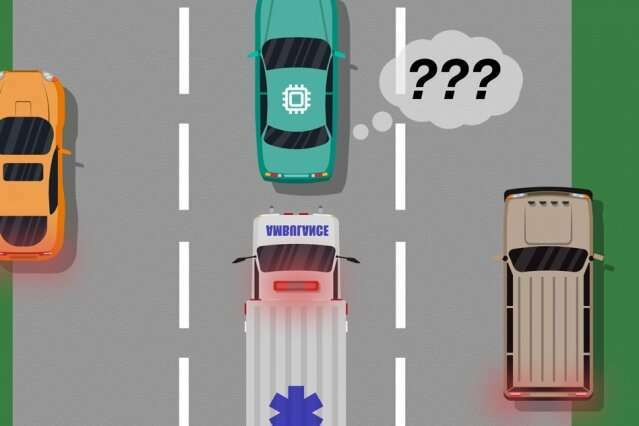 A novel model developed by MIT and Microsoft researchers identifies instances in which autonomous systems have "learned" from training examples that don't match what's actually happening in the real world. Engineers could use this model to improve the safety of artificial intelligence systems, such as driverless vehicles and autonomous robots. Consider a driverless car that wasn't trained, and more importantly doesn't have the sensors necessary, to differentiate between distinctly different scenarios, such as large, white cars and ambulances with red, flashing lights on the road. If the car is cruising down the highway and an ambulance flicks on its sirens, the car may not know to slow down and pull over, because it does not perceive the ambulance as different from a big white car. In a pair of papers—presented at last year's Autonomous Agents and Multiagent Systems conference and the upcoming Association for the Advancement of Artificial Intelligence conference—the researchers describe a model that uses human input to uncover these training "blind spots." "The model helps autonomous systems better know what they don't know," says first author Ramya Ramakrishnan, a graduate student in the Computer Science and Artificial Intelligence Laboratory. "Many times, when these systems are deployed, their trained simulations don't match the real-world setting [and] they could make mistakes, such as getting into accidents. The idea is to use humans to bridge that gap between simulation and the real world, in a safe way, so we can reduce some of those errors."